Kathy and I have just made it home from an 8 day trip to photograph the canyons of the Southwest. The photographic workshop started at Bryce Canyon, moved to Zion Canyon and finished with a couple of days along the north rim of Grand Canyon. We had near perfect photographic and weather conditions during the workshop. Each day we got started before sunrise and we worked the landscape all day and through sunset trying to find great places to take top notch images. Over the next postings I will share these images with you as I work through my top tier images from the trip. Please take a few minutes to see these spectacular shots and let me know what you think. I believe these images to be some of my very best work. 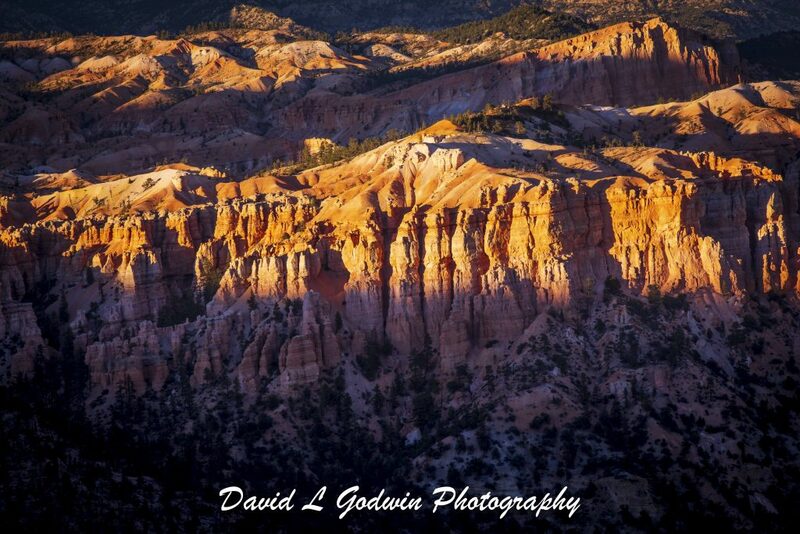 This first image posted was taken at sunset at Bryce Canyon. It captures the beautiful lighting against the peaks as the last few rays of sunlight are dragged down into the shadows !